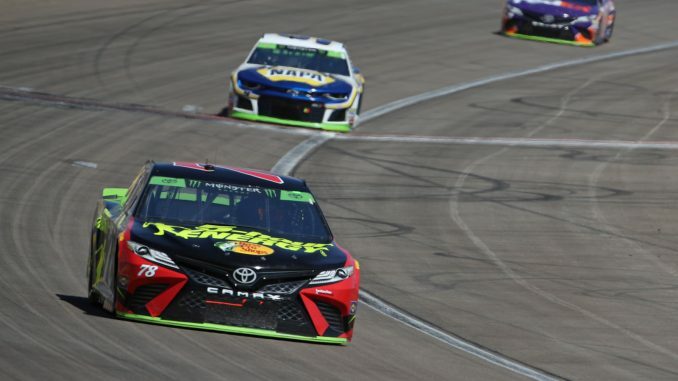 Martin Truex Jr. took the Monster Energy NASCAR Cup Series championship lead Sunday afternoon with a third place finish in the Playoff opening South Point 400 at Las Vegas Motor Speedway. The driver of the No. 78 Furniture Row Racing Toyota led the most laps (96) and out-pointed the two other most dominant regular season drivers – Kyle Busch and Kevin Harvick to hold a two-point advantage on the 16-driver Cup Playoff field as it heads to Richmond (Va.) Raceway next weekend. Penske Racing’s Brad Keselowski won his third consecutive Cup race and the legendary team’s 500th overall auto racing trophy, but Truex reminded everyone afterward that it was also Keselowski’s third consecutive victory without leading the most laps in a race. So Truex – a four-time winner this season – acknowledged feeling confident and optimistic even in his podium showing Sunday. 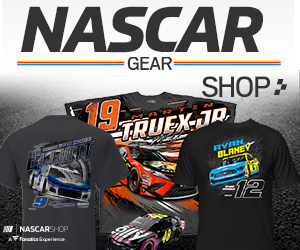 “Brad clearly found a horseshoe,’’ Truex said, allowing a slight smile. “Three races in a row he’s won and he has not had the best car. “… Obviously he hasn’t led the most laps in any of those races, and he showed up at the end with good pit stops and good short run speed. I think clearly it’s pretty obvious how it worked out. He’s hot right now. He’s on a streak. That’s the way it goes. Three weeks ago Keselowski started the streak with a win at Darlington, leading 24 laps compared to Kyle Larson’s 284 out front. He won again at Indianapolis last week leading nine laps total, compared to 37 laps out front for both Denny Hamlin and Clint Bowyer. And this is the third three-race winning streak on the year. Seven-time 2018 winner Kevin Harvick won three straight early in the schedule, including the regular season race here at Las Vegas in March. Kyle Busch, a six-time race winner in 2018, won three straight in April at Texas, Bristol, Tenn. and Richmond. But both Harvick and Busch – who were tied atop the standings entering the Las Vegas Playoff opener – either crashed out (Harvick) or had to rally from a mishap (Busch). Truex’s strong effort Sunday resulted in his place atop the championship – by two points over Busch and 18 over Keselowski. And the 2017 series champ was especially impressed by his team’s hard work – heartily disproving naysayers who have questioned whether the crew would still be as devoted or motivated after news that the team would cease operations after the season. “Too many cautions at the end and it really, really took away our chances at winning,’’ Truex explained. “It was obviously clear that after 15 or 20 laps we were the class of the field. “[The finish] was a little disappointing, but at the same time, to answer the call of all the critics and all the people who asked, ‘Could we rise up back to where we were last year with all the distractions of the team shutting down at the end of the year?’ I’m really happy about that and really proud of the speed we brought today.